Secret Compartment Furniture – These guys only make furniture with secret compartments. Each item is handmade by Amish craftsmen in Holmes County, Ohio from brown maple, oak, cherry, quarter-sawn oak, or any other wood you may desire. Pieces are available in a variety of local retailer locations, or can be shipped. Products include tables, beds, storage benches, coat racks and mantels. 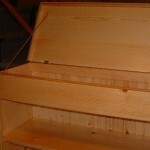 False Bottom Productions, LLC – Located in Farmington, Connecticut, this company produces sturdy all-wood constructed furniture, each with a secret compartment within. 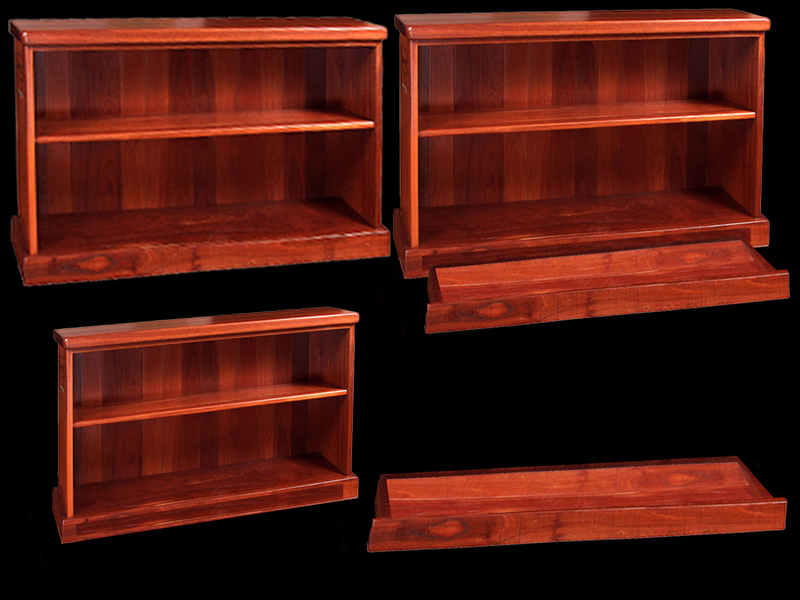 Products like bookcases with fold up tops provide ample hidden storage space, and still provide the basic function it was built for. Other furniture products include cupboards, coffee tables and wooden columns with concealed storage. They do custom furniture requests as well. 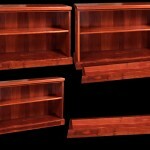 InnoFab – This New Jersey company makes a variety of wooden furniture with secret compartments. Their slide-top coffee table can hold up to 5 long guns inside. 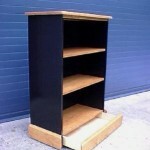 They also make night stands, bookshelves and end tables with hidden compartments. All furniture is made to order, so I believe they’re open to custom furniture requests that follow the same hidden compartment and firearms theme. Custom Chess – Mike Kirby in Michigan makes these tables by hand in his small workshop after their ordered. They look like a standard solid wood end table or nightstand with a working front drawer, but the have an easily accessible secret compartment on the side that can be opened with a latch hidden under the edge of the table. 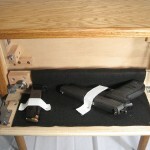 The compartment can house diary, firearm or other items that are better left hidden. There are nice example videos of the tables in use on the Custom Chess website. Naoki Hirakoso Kai Table – This low-profile coffee table is more of a novelty than a normal table with hidden compartment. 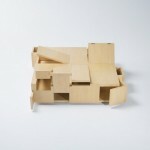 This Japanese piece of furniture is made almost entirely of secret compartments. From sliding drawers and hinged cupboards to a number of shifting panels, the table is put together like a giant wooden 3D puzzle. 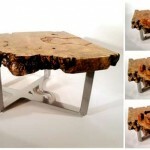 Secret Compartment Coffee Tables – Scott Dworkin is a skilled furniture designer that works with metal, glass and wood. Our interest is in his wooden coffee tables with hidden storage and secret compartments nestled in. These start as raw slabs of wood, then Scott carves out a series of nooks, boxes and compartments that turns the piece into a giant 3D puzzle. The compartments in these particular tables are visible, so they’re more for novelty than actual secret stashes. These appear to be completely custom pieces with top-notch craftsmanship. 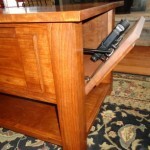 Patriot Woodworks – This looks to be a newer company with aspirations to make furniture that can conceal various firearms. These compartments could be repurposed to house anything you needed. Right now they only have a coffee table prototype with a fold out door on one end. They do seem capable though, and I’d imagine they’re available for custom orders as well. 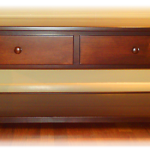 Delnero Furniture – These guys don’t specialize in secret compartment furniture, but they are fully capable of implementing hidden drawers on custom furniture projects. This Shaker desk includes a hutch with drawers. 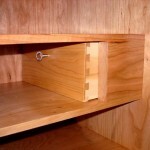 If the side drawers are removed, these secret compartment drawers can be pulled out with a skeleton key. Clever. 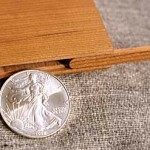 Keep It Safe Furniture – These guys make to order solid wood bookshelves with secret stash safe drawers located in the base. The drawers using a secret mechanism. They also custom make clocks with hidden compartments and wooden picture frame wall safes. C. H. Becksvoort Custom Furniture – Mr. Becksvoort makes very hiqh quality furniture of about any type, paying extremely fine attention to details. His portfolio contains a wide range of pieces, from lighting and desks to beds and shelves, including many with intricate doors and drawers. He can incorporate secret compartments of different shapes and sizes into you piece upon request. 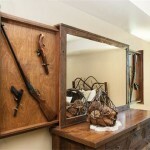 For rustic and distressed custom furniture with secret compartments, check out MH Custom Woodworks. Their specialty in custom cabinetry gives them the experience to create solid furniture with high quality craftsmanship. But they also incorporate their creative side while developing a wide range of furniture pieces with secret compartments incorporated. They can do nightstands, chests of drawers, tables and one off items like this mirror with secret storage behind.